On Saturday I noticed there were still a lot of pears in the fruit bowl. They had been very hard when I bought them but now were suddenly all ripe at the same time. I knew right away what I woudl do with them, because since last weekend I have been smelling the Star Anise in the cupboard every time I opened the door. I couldn't get it all to fit in my spice jar and there were two 'stars' in the open box. So I put some water in a pan with two tablespoons of light brown sugar, the two star anise, half a cinnamon stick and four cloves. I put it on a gentle heat to let the sugar melt, while I peeled the pears and cored them from the bottom - ouch! Once the sugar had melted, I poached the pears for about 20 minutes, then left them to cool in the syrup. Once cool, I lifted them out into a dish and then returned the syrup to the pan and turned up the heat. Now I was planning to reduce it slightly, but went to do something else and just caught it as it turned to caramel! Another few seconds and it would have been ruined. I poured it over the cooled pears and found that indeed I did have caramel, with strands just like James Martin :o So I thought I should take a picture, because I'm sure I would never get the caramel right if was trying! 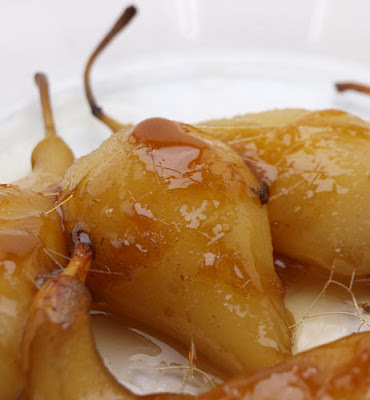 Yum, there's nothing better than pears and caramel! Mmmm, got distracted by these rather than the cheesecake - they look heavenly! Gotta try the caramel pears! Great photo - love the colour of the caramel too, I can almost taste it!